Postage stamp may also refer to a formatting artifact in the display of film or video: Windowbox. A postage stamp is a small piece of paper that is purchased and displayed on an item of mail as evidence of payment of postage. Typically, stamps are printed on special custom-made paper, show a national designation and a denomination (value) on the front, and have an adhesive gum on the back or are self-adhesive. Postage stamps are purchased from a postal administration or other authorized vendor, and are used to pay for the costs involved in moving mail, as well as other business necessities such as insurance and registration. They are sometimes a source of net profit to the issuing agency, especially when sold to collectors who will not actually use them for postage. Stamps are usually rectangular, but triangles or other shapes are occasionally used. The stamp is affixed to an envelope or other postal cover (e.g., packet, box, mailing cylinder) the customer wishes to send. 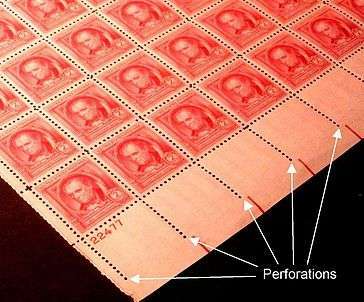 The item is then processed by the postal system, where a postmark, sometimes known as a cancellation mark, is usually applied in overlapping manner to stamp and cover. This procedure marks the stamp as used to prevent its reuse. In modern usage, postmarks generally indicate the date and point of origin of the mailing. The mailed item is then delivered to the address the customer has applied to the envelope or parcel. Postage stamps have facilitated the delivery of mail since the 1840s. Before then, ink and hand-stamps (hence the word 'stamp'), usually made from wood or cork, were often used to frank the mail and confirm the payment of postage. The first adhesive postage stamp, commonly referred to as the Penny Black, was issued in the United Kingdom in 1840. The invention of the stamp was part of an attempt to reform and improve the postal system in the United Kingdom of Great Britain and Ireland, which, in the early 19th century, was in disarray and rife with corruption. There are varying accounts of the inventor or inventors of the stamp. 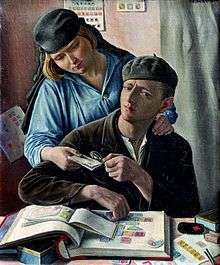 Before the introduction of postage stamps, mail in the UK was paid for by the recipient, a system that was associated with an irresolvable problem: the costs of delivering mail were not recoverable by the postal service when recipients were unable or unwilling to pay for delivered items, and senders had no incentive to restrict the number, size, or weight of items sent, whether or not they would ultimately be paid for. The postage stamp resolved this issue in a simple and elegant manner, with the additional benefit of room for an element of beauty to be introduced. Concurrently with the first stamps, the UK offered wrappers for mail. Later related inventions include postal stationery such as prepaid-postage envelopes, post cards, lettercards, aerogrammes, postage meters, and, more recently, specialty boxes and envelopes provided free to the customer by the U.S. postal service for priority or express mailing. The postage stamp afforded convenience for both the mailer and postal officials, more effectively recovered costs for the postal service, and ultimately resulted in a better, faster postal system. With the conveniences stamps offered, their use resulted in greatly increased mailings during the 19th and 20th centuries. Postage stamps during this era were the most popular way of paying for mail; however, by the end of the 20th century were rapidly being eclipsed by the use of metered postage and bulk mailing by businesses. As postage stamps with their engraved imagery began to appear on a widespread basis, historians and collectors began to take notice. The study of postage stamps and their use is referred to as philately. Stamp collecting can be both a hobby and a form of historical study and reference, as government-issued postage stamps and their mailing systems have always been involved with the history of nations. Throughout modern history, numerous innovations were used to apply or indicate that postage has been paid on a mailed item, hence the invention of the postage stamp has been accredited to several different people. In 1680 William Dockwra, an English merchant in London, and his partner Robert Murray established the London Penny Post, a mail system that delivered letters and small parcels inside the city of London for the sum of one penny. The postage for the mailed item was prepaid by the use of a hand-stamp to frank the mailed item, confirming payment of postage. 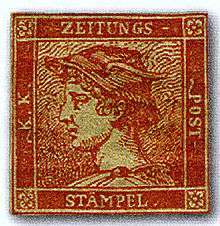 Though this 'stamp' was applied to a letter instead of a separate piece of paper it is considered by many historians as the world's first postage stamp. In 1835, the Slovene civil servant Lovrenc Košir from Ljubljana in Austria-Hungary (now Slovenia), suggested the use of "artificially affixed postal tax stamps" using "gepresste papieroblate" which translates as "pressed paper wafers" but although the suggestion was looked at in detail, it was not adopted. 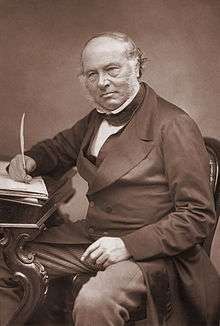 The Englishman Sir Rowland Hill began interest in postal reform in 1835. In 1836, a Member of Parliament, Robert Wallace, provided Hill with numerous books and documents, which Hill described as a "half hundred weight of material". Hill commenced a detailed study of these documents, leading him to the 1837 publication of a pamphlet entitled "Post Office Reform its Importance and Practicability". He submitted a copy of this to the Chancellor of the Exchequer, Thomas Spring-Rice, on 4 January 1837. This first edition was marked "private and confidential," and was not released to the general public. The Chancellor summoned Hill to a meeting during which the Chancellor suggested improvements and changes to be presented in a supplement, which Hill duly produced and supplied on 28 January 1837. Rowland Hill then received a summons to give evidence before the Commission for Post Office Enquiry on 13 February 1837. During his evidence, he read from the letter he wrote to the Chancellor, including a statement the notation of paid postage could be created "...by using a bit of paper just large enough to bear the stamp, and covered at the back with a glutinous wash...". This is the first publication of an unambiguous description of a modern adhesive postage stamp (though the term "postage stamp" did not yet exist at that time). Shortly afterward, the second edition of Hill’s booklet, dated 22 February 1837, was published, and made available to the general public. This booklet, containing some 28,000 words, incorporated the supplement given to the Chancellor, and statements he made to the Commission. Hansard records that on 15 December 1837, Benjamin Hawes inquired to the Chancellor of the Exchequer "whether it was the intention of the Government to give effect to the recommendation of the Commissioners of the Post-office, contained in their ninth report relating to the reduction of the rates of postage, and the issuing of penny stamps?" 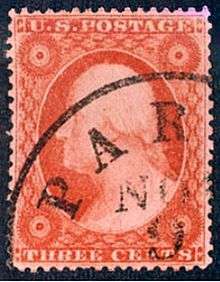 Hill’s ideas for postage stamps and charging paid-postage based upon weight soon took hold, and were adopted in many countries throughout the world. With the new policy of charging by weight, using envelopes for mailing documents became the norm. Hill’s brother Edwin Hill invented a prototype envelope-making machine that folded paper into envelopes quickly enough to match the pace of the growing demand for postage stamps. Rowland Hill and the postal reforms he introduced to the UK postal system are commemorated on several commemorative postage issues of the United Kingdom. Scotsman Patrick Chalmers asserted the claim that his father, James Chalmers, was the inventor of the first postage stamp in the 1881 publication "The Penny Postage Scheme of 1837." In this book, the son claims James Chalmers first produced an essay describing and advocating a stamp in August 1834; however, no evidence for this is provided in the book. Until his death in 1891, Patrick Chalmers campaigned to gain recognition for his father as the inventor of the postage stamp. The first independent evidence for Chalmers' claim is the essay and proposal he submitted for adhesive postage stamps to the General Post Office, dated 8 February 1838 and received by the Post Office on 17 February 1838. In this approximately 800-word document concerning methods of indication letters postage-paid he states, "Therefore, of Mr Hill’s plan of a uniform rate of postage ... I conceive that the most simple and economical mode ... would be by Slips ... in the hope that Mr Hill’s plan may soon be carried into operation I would suggest that sheets of Stamped Slips should be prepared ... then be rubbed over on the back with a strong solution of gum ...". Chalmers' original document is now in the UK's National Postal Museum. Given the postage denominations stated in James Chalmers' essay mirrored those proposed by Rowland Hill in February 1837, it is clear Chalmers was aware of Hill’s proposals. It is unknown whether Chalmers obtained a copy of Hill’s booklet, or simply read about it in The Times newspaper that on two occasions - 25 March 1837, 20 December 1837 - reported in great detail Hill’s proposals. Neither of Hill's articles mention of "a bit of paper just large enough to bear the stamp," hence available information at the time via the Times' article could not have made Chalmers aware Hill previously made such a proposal. This suggests either Chalmers previously read Hill's booklet and was merely expounding on Hill's idea, or he concurrently and independently developed the idea of the modern postage stamp. James Chalmers organized petitions "for a low and uniform rate of postage". The first such petition was presented in the House of Commons on 4 December 1837 (from Montrose). Further petitions organised by him were presented on 1 May 1838 (from Dunbar and Cupar), 14 May 1838 (from the county of Forfar), and 12 June 1839. In this period of time, other groups organized petitions and presented them to Parliament. All petitions for consumer-oriented, low-cost, volume based postal rates following the disclosure of Hill's proposals. The first stamp, the "Penny black", became available for purchase 1 May 1840, to be valid as of 6 May 1840. Two days later, 8 May 1840, the Two pence blue was introduced. The Penny black was sufficient for a letter less than half an ounce to be sent anywhere within the UK. Both stamps included an engraving of the young Queen Victoria, without perforations, as the first stamps were separated from their sheets by cutting them with scissors. The first stamps did not need to show the issuing country, so no country name was included on them. The UK remains the only country to omit its name on postage stamps, using the reigning monarch’s head as country identification. Following the introduction of the postage stamp in the UK, prepaid postage considerably increased the number of letters mailed. Before 1839, the number of letters sent in the UK was typically 76 million. 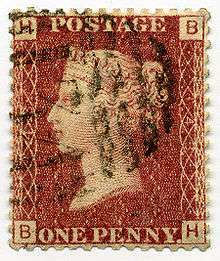 By 1850 this increased five-fold to 350 million, continuing to grow rapidly until the end of the 20th century when newer methods of indicating the payment of postage reduced the use of stamps. Other countries soon followed the UK with their own stamps. The Canton of Zürich in Switzerland issued the Zurich 4 and 6 rappen on 1 March 1843. 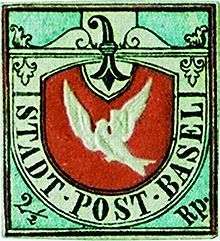 Although the Penny black could be used to send a letter less than half an ounce anywhere within the UK, the Swiss did not initially adopt that system, instead continuing to calculate mail rates based on distance to be delivered. Brazil issued the Bull’s Eye stamp on 1 August 1843. Using the same printer used for the Penny black, Brazil opted for an abstract design instead of the portrait of Emperor Pedro II, so his image would not be disfigured by a postmark. In 1845 some postmasters in the United States issued their own stamps, but it was not until 1847 that the first official U.S. stamps were issued: 5 and 10 cent issues depicting Benjamin Franklin and George Washington. 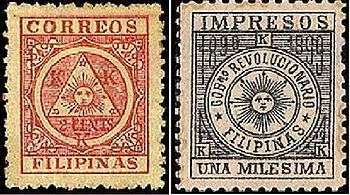 A few other countries issued stamps in the late 1840s. The famous Mauritius "Post Office" stamps were issued by Mauritius in September 1847. Many others, such as India, started their use in the 1850s, and by the 1860s most countries issued stamps. The United States government and the Post Office were quick to follow the lead of the U.K. In the U.S., the use of postage stamps caught on quickly and became more widespread when on March 3, 1851, the last day of its legislative session, Congress passed the Act of March 3, 1851 (An Act to reduce and modify the Rates of Postage in the United States). Similarly introduced on the last day of the Congressional session four years later, the Act of March 3, 1855 required the prepayment of postage on all mailings. Thereafter, postage stamp use in the U.S. quickly doubled, and by 1861 had quadrupled. In 1856, under the direction of Postmaster General James Campbell, Toppan and Carpenter, (commissioned by the U.S. government to print U.S. postage stamps through the 1850s) purchased a rotary machine designed to separate stamps, patented in England in 1854 by William and Henry Bemrose, who were printers in Derby, England. The original machine cut slits into the paper rather than punching holes, but the machine was soon modified. The first stamp issue to be officially perforated, the 3-cent George Washington, was issued by the U.S. Post Office on February 24, 1857. Between 1857 and 1861 all stamps originally issued between 1851 and 1856 were reissued with perforations. Initial capacity was insufficient to perforate all stamps printed, thus perforated issues used between February and July 1857 are scarce and quite valuable. Stamp collecting is a popular hobby. 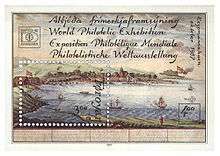 Collecting is not the same as philately, which is defined as the study of stamps. It is not necessary to closely study stamps in order to enjoy collecting them. Many casual collectors enjoy accumulating stamps without worrying about the details. The creation of a valuable or comprehensive collection, however, may require some philatelic knowledge. In the United States there is concern among some collectors that the United States Postal Service has become a promotional agent for the media and entertainment industry, as it has frequently issued entire sets of stamps featuring movie stars and cartoon characters like Mickey Mouse and Bart Simpson Over the decades the annual average number of new postage stamp issued by the U.S.P.S. has significantly increased. ↑ Pitney-Bowes Postage Meter Company Excerpt: (Entering the final decade of the century, PB saw its sales surpass the $3 billion mark for the first time in company history, topping off at $3.2 billion in fiscal 1990. ↑ "William Dockwra and the Penny Post Service". Canadian Museum of Civilization. Retrieved 8 November 2010. ↑ Lovrenc Košir stampdomain.com 2012. Retrieved 1 March 2012. Archived here. ↑ "Meet the new Rowland Hill" in Gibbons Stamp Monthly, April 1949, p. 85. ↑ Garfield, Simon (January 2009). The Error World: An Affair with Stamps. Boston: Houghton Mifflin Harcourt. p. 118. ISBN 0-15-101396-9. ↑ O'Donnell, Kevin; Winger, Larry (1997). Internet for Scientists. CRC Press. p. 19. ISBN 90-5702-222-2. ↑ Stamps not intended for international mail, such as postage due stamps, do not need to have the country's name. ↑ Stanley Gibbons Ltd, Specialised Stamp Catalogue Volume 1: Queen Victoria (8th ed. 1985) p. 207. ↑ Kenmore Collector’s Catalog, 2010, #906. ↑ "Holography: Into the Future". National Postal Museum. Retrieved 2011-01-22. ↑ Associated Press (2000-06-14). "First round U.S. postage stamp on the way, and that's not all. . .". Seattle Post-Intelligencer. Retrieved 2011-01-22. ↑ "Bhutan - Talking Stamps" and Other World Firsts!". Sandafayre (Holdings) Ltd. Retrieved 2013-05-19. ↑ Thomas Mallon "Stamp: Sober Superheroes, " American Heritage, Nov./Dec. 2006. 1 2 Scotts United States Stamp Catalogue, First Day of Issue Index. ↑ See, for example, the low value Afghanistan issues of 1964.